Fate: Sold for scrap on 01 JUN 1961 to Boston Metals. 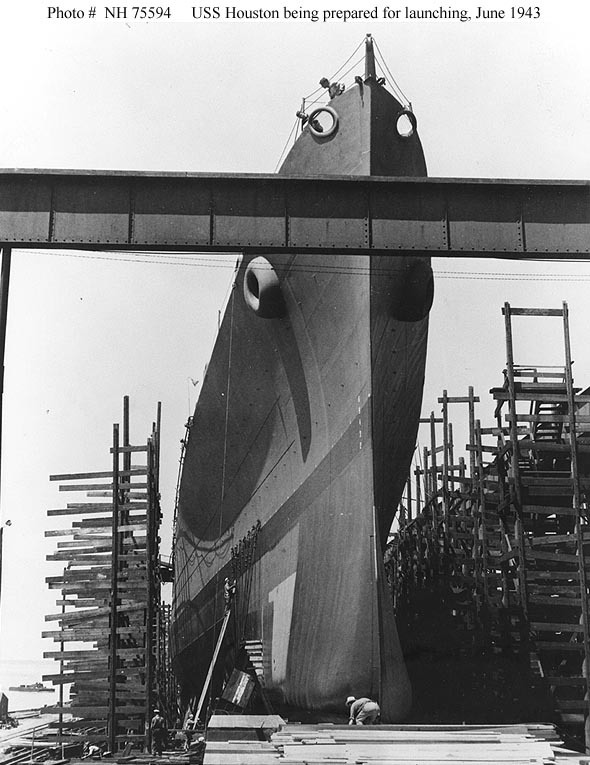 USS Houston (CL 81) Being prepared for launching, at the Newport News Shipbuilding and Dry Dock Company shipyard, Newport News, Virginia, 16 June 1943. She was launched on 19 June. Courtesy of James Russell, 1972. U.S. Naval Historical Center Photograph #NH 75594. 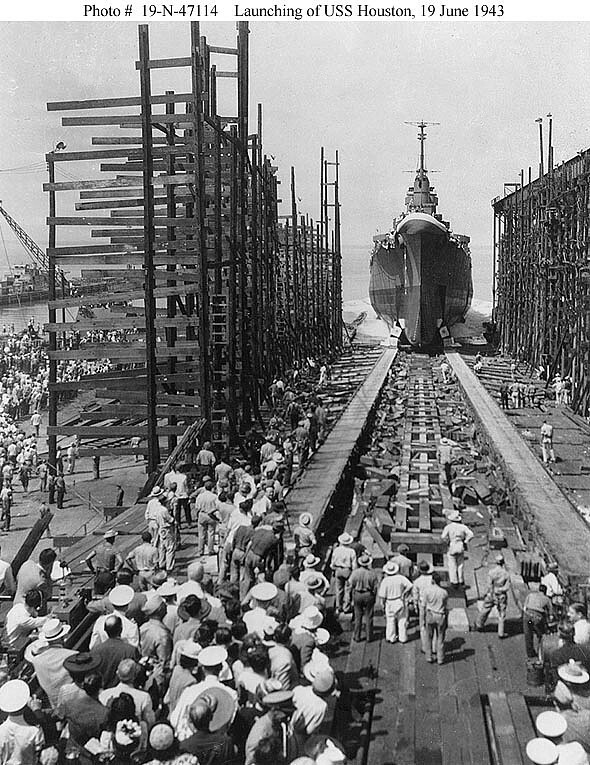 USS Houston (CL 81) Launching, at the Newport News Shipbuilding and Dry Dock Company shipyard, Newport News, Virginia, 19 June 1943. Photograph from the Bureau of Ships Collection in the U.S. National Archives #19-N-47114. Photograph from the Bureau of Ships Collection in the U.S. National Archives #19-N-60240. Photograph from the Bureau of Ships Collection in the U.S. National Archives #19-N-60241. 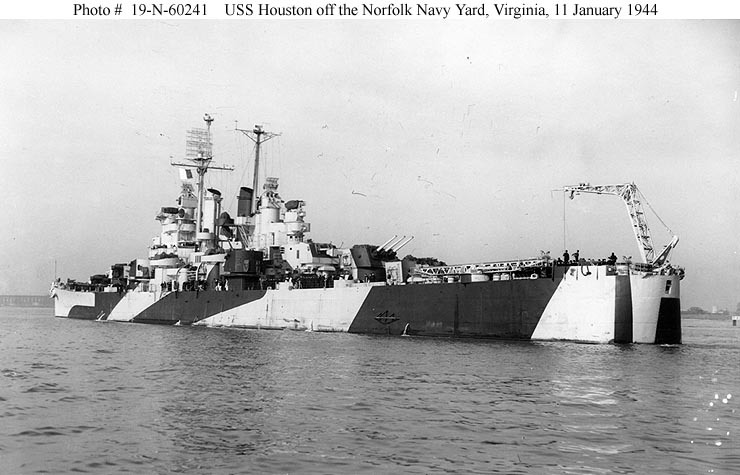 USS Houston (CL 81) Off Norfolk, Virginia, 12 January 1944. She is painted in Camouflage Measure 32, Design 1d. Official U.S. Navy Photograph, now in the collections of the National Archives #80-G-214200. BuAer photo # 30348, out of U.S. 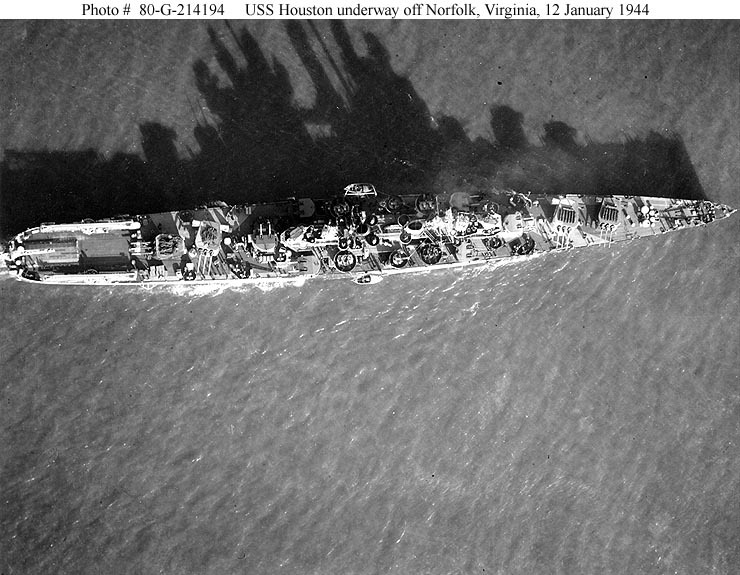 Naval Air Station, Hampton Roads, VA.
USS Houston (CL 81) Vertical photograph of the ship underway off Norfolk, Virginia, 12 January 1944. Official U.S. Navy Photograph, now in the collections of the National Archives #80-G-214194. USS Houston (CL 81) Steaming at sea, probably in the Pacific, 01 May 1944. Official U.S. Navy Photograph, from the collections of the Naval Historical Center #NH 98341 (Caption updated by Bob Hurst). 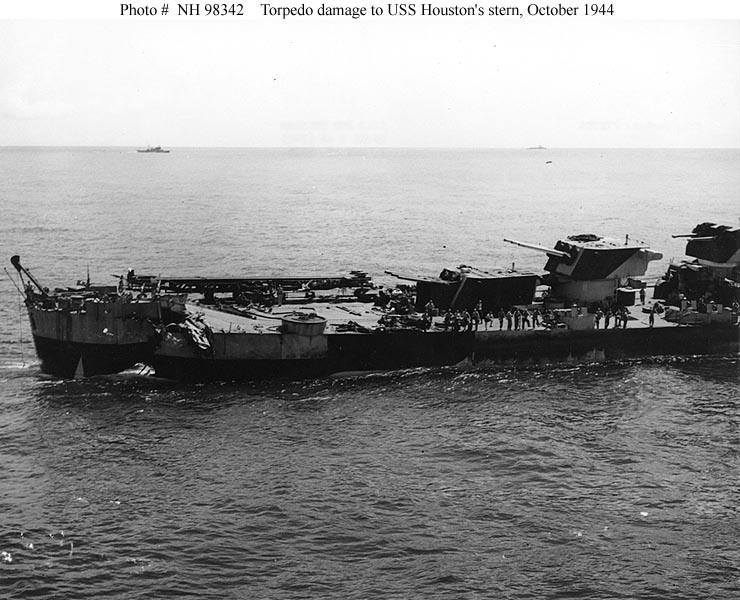 Houston was struck by an aerial torpedo on October 14, 1944, only 80 miles off Japanese held Formosa. 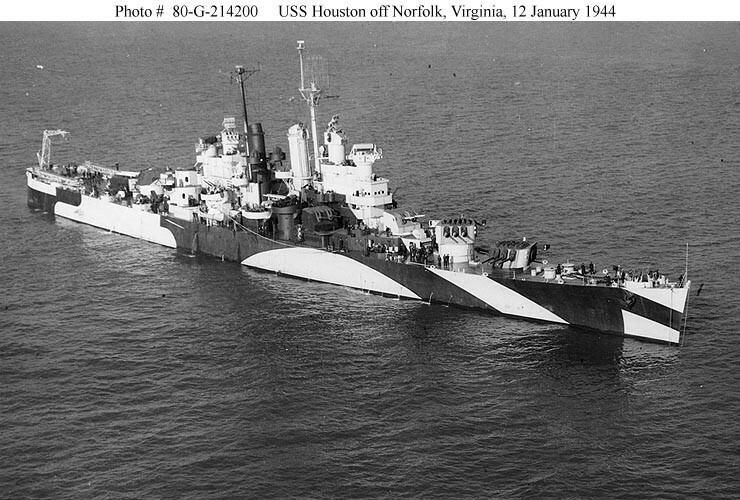 Houston was struck again on the 16th in the stern, which nearly did the ship in due to the increased flooding in the already weakened hull. Through Herculean efforts by her crew, some luck, and calm waters, the Houston made it back to the safe confines of Ulithi Atoll on October 27, 1944. She was sufficiently patched up for the long trip back to the States, arriving at New York Navy Yard on March 20, 1945. She never fought again and was being repaired when the war ended. Most of the images below show Houston in her fight for life, Never has a vessel shipped that much water and remained afloat, A fine tribute to her crew, You all achieved the impossible. Task Force 38 Raids on Formosa, October 1944 - A destroyer alongside the damaged USS Houston (CL 81) on 15 October 1944, removing excess crewmen after she was torpedoed by Japanese aircraft off Formosa. 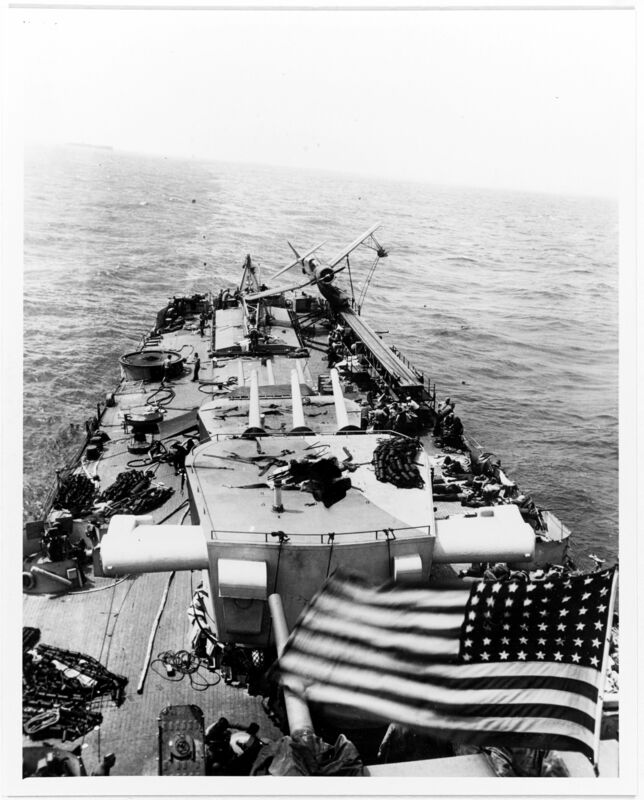 Photographed from USS Boston (CA 69). Note OS2U floatplane on Boston's port catapult. Official U.S. Navy Photograph, now in the collections of the National Archives #80-G-272781. View looking aft, showing damage to the ship's stern area resulting from a torpedo hit amidships received off Formosa on 14 October 1944. 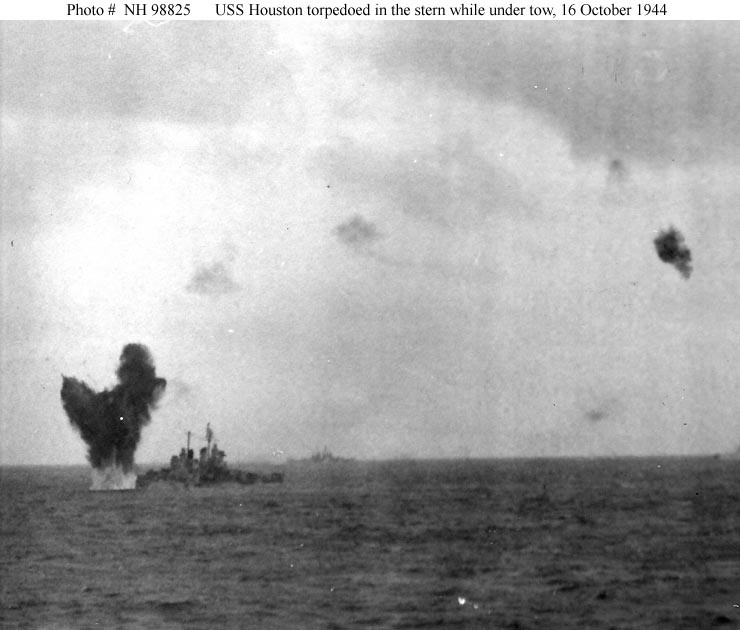 This photo was taken while Houston was under tow, but prior to the second torpedo hit on 16 October. Note OS2U floatplane that had been jarred off the port catapult, breaking its wing on impact with the aircraft crane. Photograph from the Bureau of Ships Collection in the U.S. National Archives #19-N-106304. Japanese aerial torpedo explodes against the ship's starboard quarter, during the afternoon of 16 October 1944. Houston had been torpedoed amidships on 14 October, while off Formosa, and was under tow by USS Pawnee (ATF 74) when enemy torpedo planes hit her again. 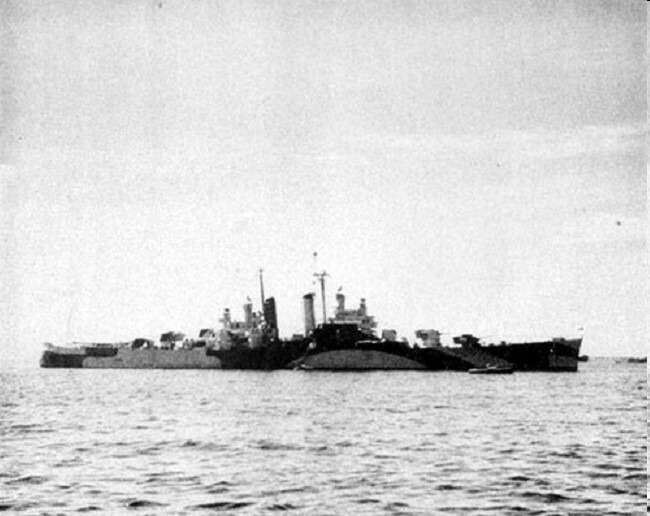 USS Canberra (CA 70), also torpedoed off Formosa, is under tow in the distance. The original photograph is in the USS Santa Fe (CL 60)"Log", a very large photo album held by the Navy Department Library. Official U.S. Navy Photograph, from the collections of the Naval Historical Center #NH 98825. Japanese aerial torpedo hits the ship's starboard quarter, during the afternoon of 16 October 1944. This view shows burning fuel at the base of the torpedo explosion's water column. 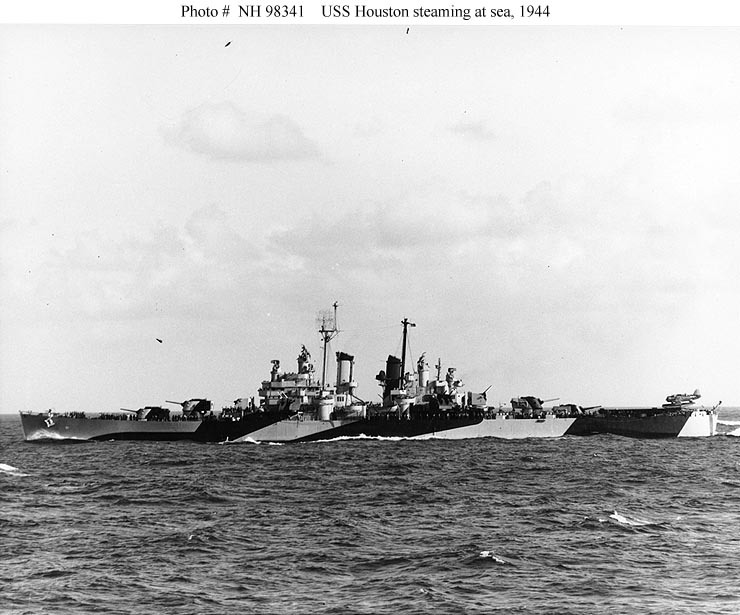 Houston had been torpedoed amidships on 14 October, while off Formosa, and was under tow by USS Pawnee (ATF 74) when enemy torpedo planes hit her again. USS Canberra (CA 70), also torpedoed off Formosa, is under tow in the distance. The original photograph is in the USS Santa Fe (CL 60) "Log", a very large photo album held by the Navy Department Library. Official U.S. Navy Photograph, from the collections of the Naval Historical Center #NH 98826. 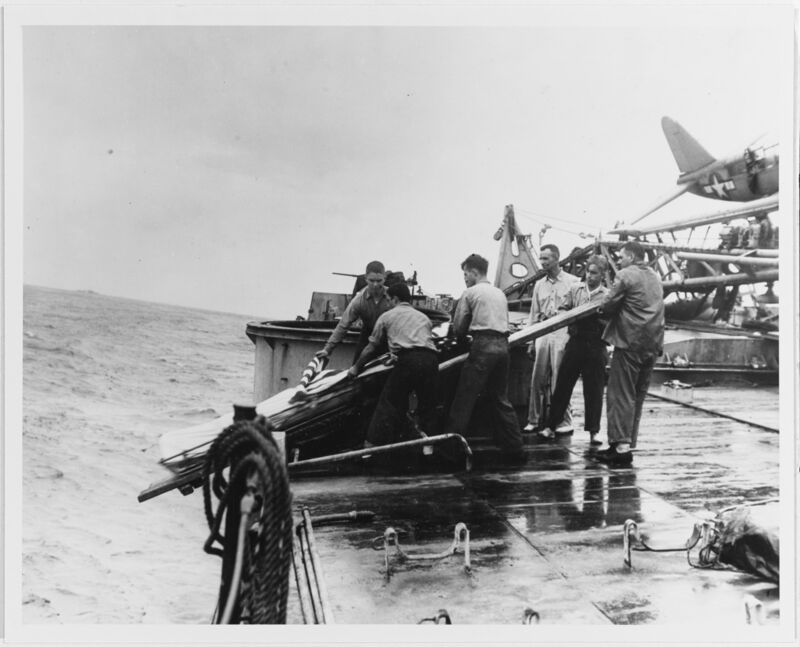 Burial at sea for crewmen killed when the ship was torpedoed off Formosa on 14 October 1944. 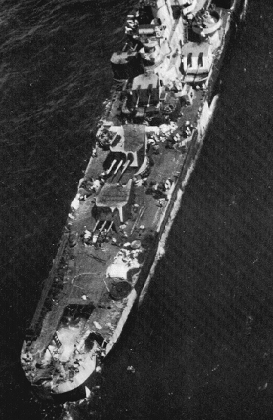 Photographed while Houston was under tow on 15 October. The following day, 16 October, she was hit in the starboard quarter (just aft of where this view was taken) by another aerial torpedo. Photograph from the Bureau of Ships Collection in the U.S. National Archives. View of the ship's torpedo-damaged stern, taken while she was under tow toward Ulithi Atoll in October 1944. 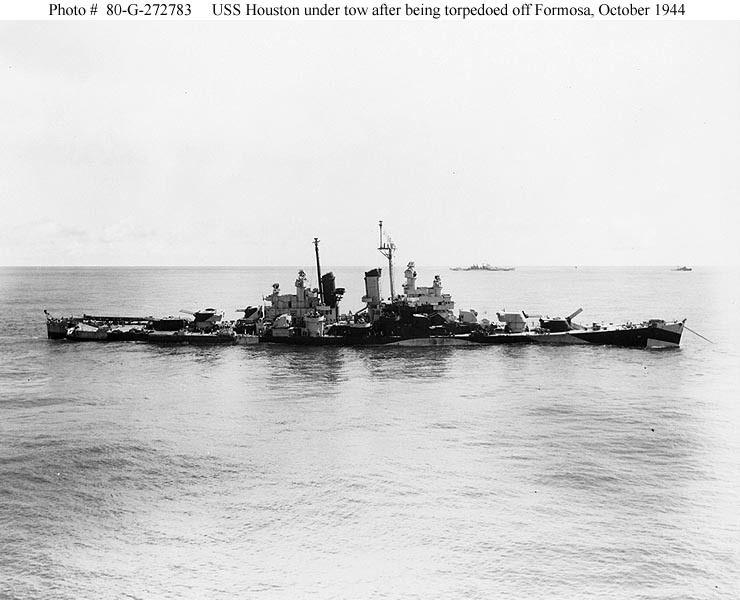 Houston was hit by two Japanese aerial torpedoes during operations off Formosa. The first struck her amidships on 14 October and the second hit her starboard quarter on 16 October. Official U.S. Navy Photograph, from the collections of the Naval Historical Center #NH 98342. 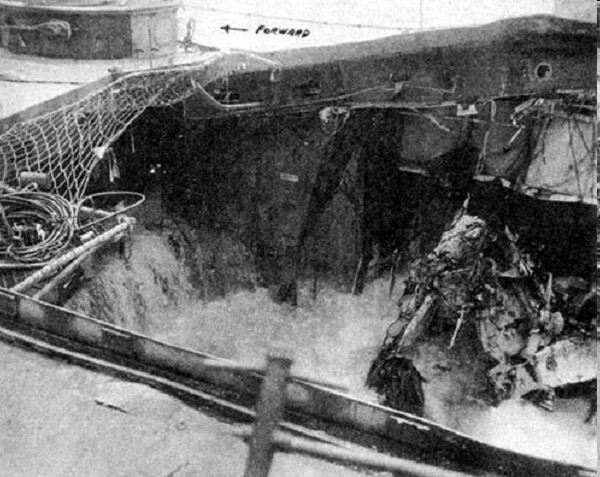 View looking aft, showing damage to the ship's stern area resulting from a torpedo hit in the starboard quarter received off Formosa on 16 October 1944. 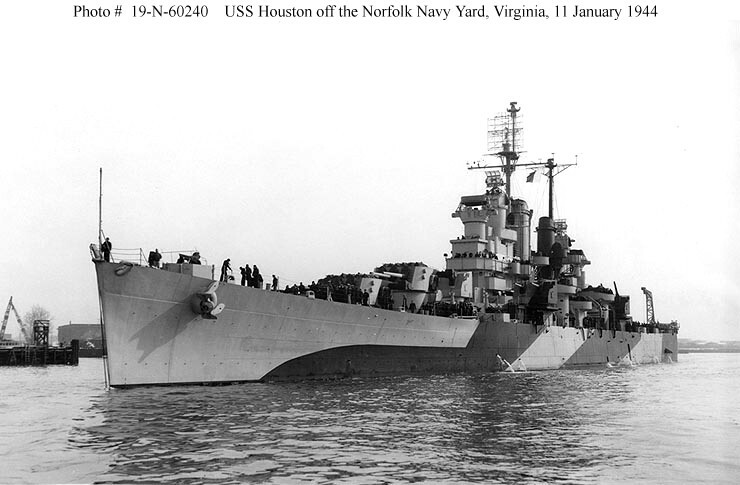 Houston had previously been torpedoed, amidships, on 14 October and was being towed out of the area when hit by the second torpedo. Note missing aircraft hangar cover and broken aircraft crane, with severe distortion of structure to starboard. 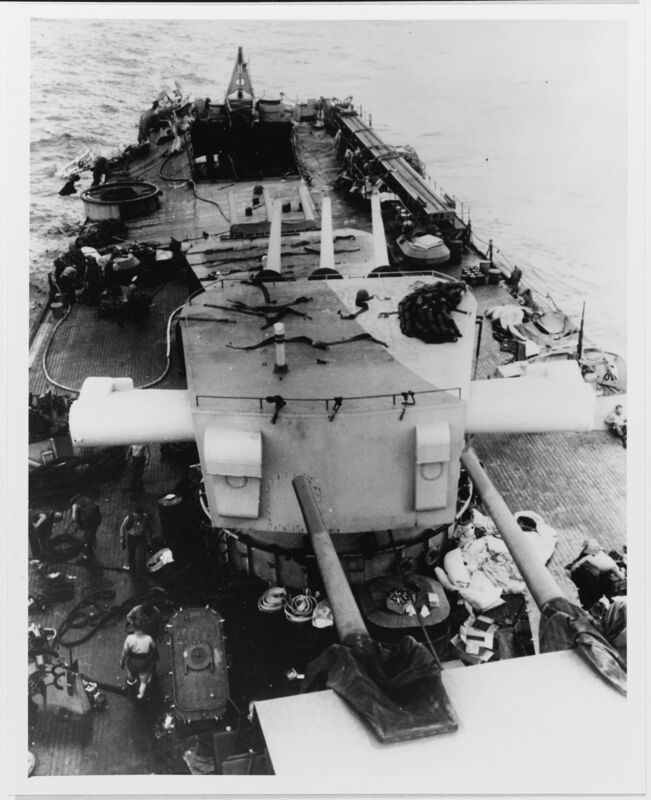 The ship's number three 6"/47 triple gun turret is in the middle of the view. Photograph from the Bureau of Ships Collection in the U.S. National Archives #19-N-110859. View of the hanger space damage, looking forward, as the USS Houston (CL 81) is en route to Ulithi. 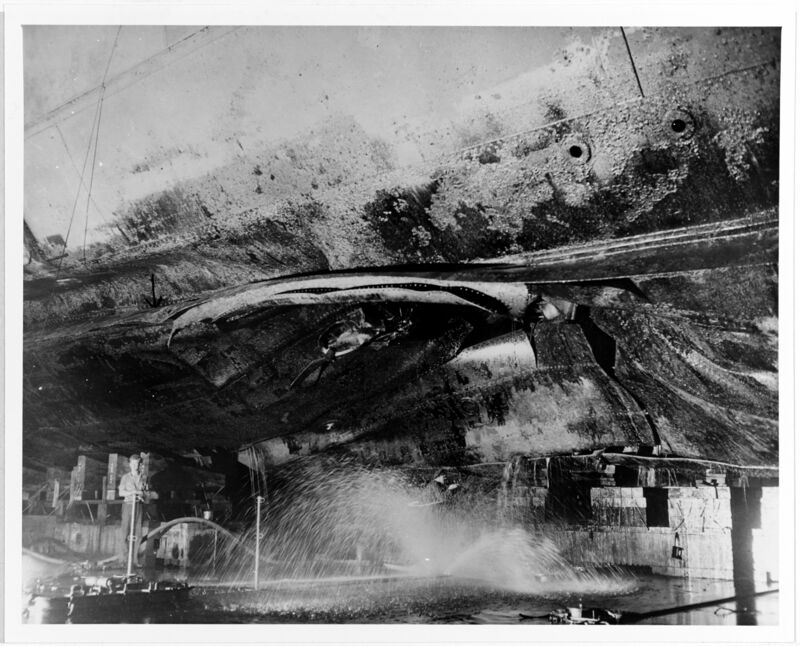 Note the upward distortion of the starboard side of the main deck and the water flowing through the hanger from the holed hull areas. Navy Department Library, War Damage Report No. 53, USS Houston (CL81) Torpedo Damage off Formosa, 14 and 16 October, 1944. USS Houston (CL 81) under tow on 17 October 1944, after she had been torpedoed twice by Japanese aircraft during operations off Formosa. 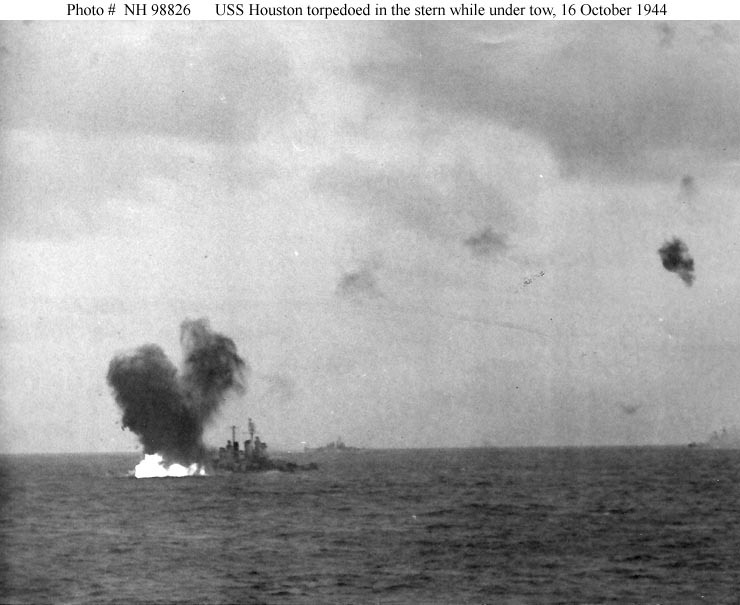 The first torpedo hit Houston amidships on 14 October. The second struck the the cruiser's starboard quarter while she was under tow on 16 October. 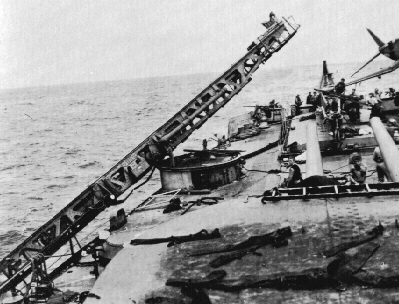 Damage from that torpedo is visible in this view. Calm waters are the main reason the ship was able to stay afloat. Even the Herculean efforts of the crew wouldn't have saved her, if the water had been rough. She suffered severe keel damage, and had lost approximately 25% of her stability. USS Canberra (CA 70), also torpedoed off Formosa, is under tow in the distance. Official U.S. Navy Photograph, now in the collections of the National Archives #80-G-272783. Midship section structural damage and repairs to the USS Houston (CL 81) from torpedo hits off Formosa on 14 and 16 October, 1944. 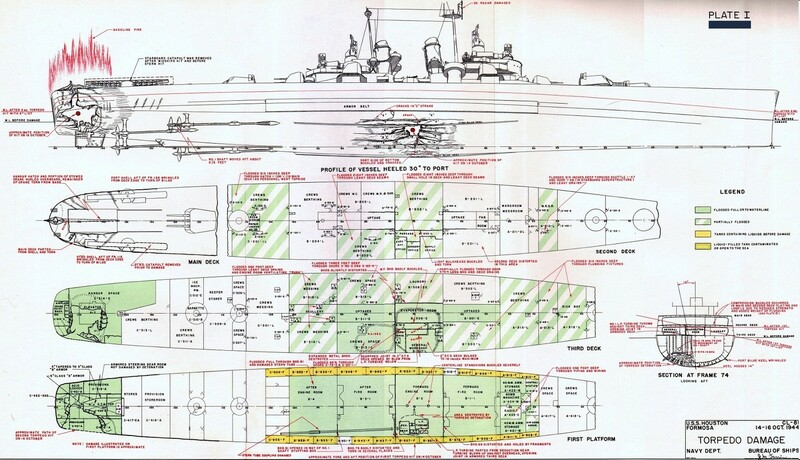 Torpedo damage diagram on the USS Houston (CL-81) from torpedo hits off Formosa on 14 and 16 October, 1944. Damage to the ship's aircraft hangar from a torpedo hit in her starboard quarter received off Formosa on 16 October 1944. 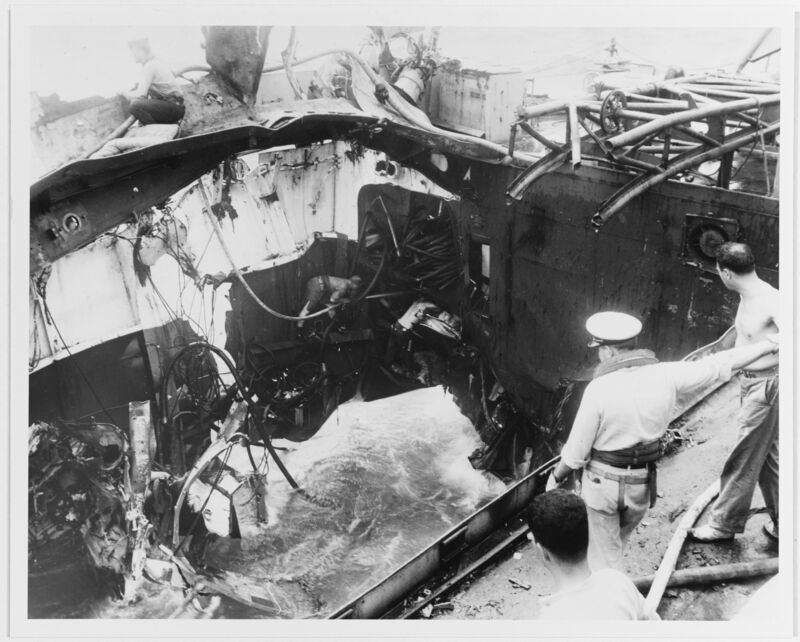 View looks through the blown-open hangar hatch in the direction of the torpedo's impact point, showing men working in the damaged area. 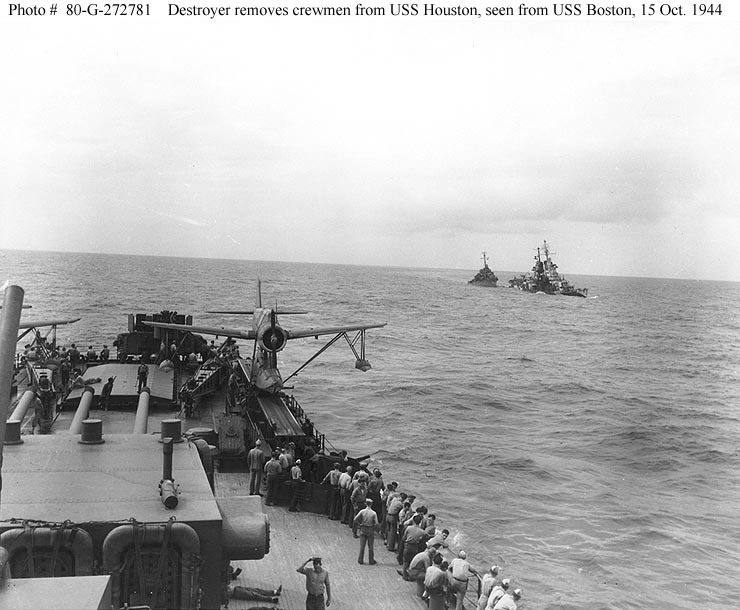 Photographed circa 27 October 1944, after Houston had been towed to Ulithi Atoll. Note broken aircraft crane at right, sea free-flooding into the hangar, and greatly distorted structure. Photograph from the Bureau of Ships Collection in the U.S. National Archives #19-N-110837. Damage to the ship's hull, amidships, from a Japanese aerial torpedo hit received off Formosa on 14 October 1944. The torpedo struck the ship on her bottom, inboard of the starboard bilge keel, while she was in a turn, producing the inward displacement of bottom plating seen here. 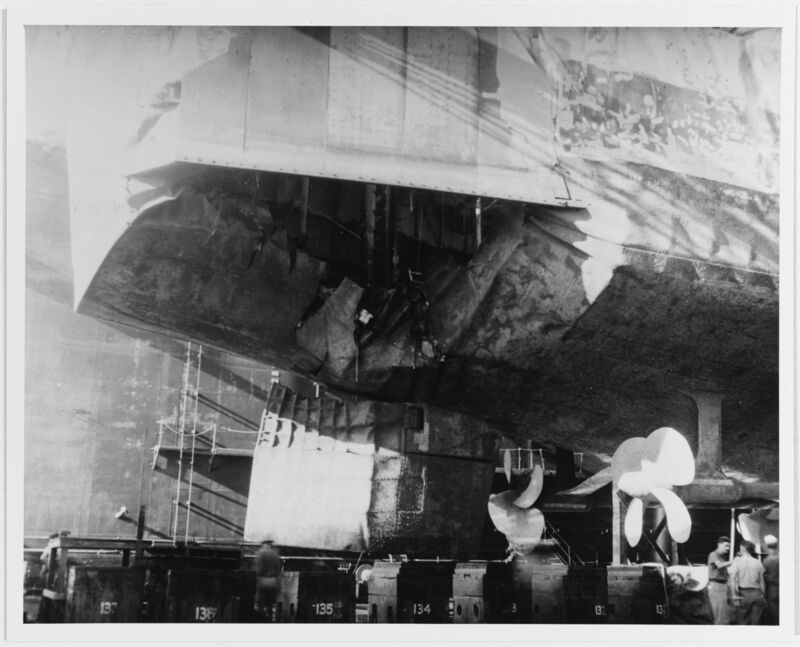 Photographed in a floating drydock at Ulithi Atoll while Houston was under repair, circa November 1944. Photograph from the Bureau of Ships Collection in the U.S. National Archives #19-N-105803. 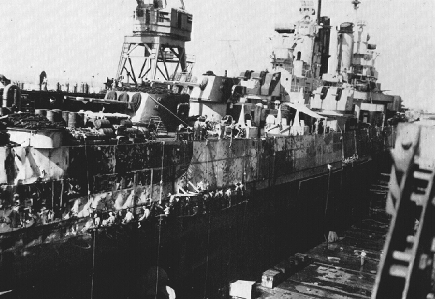 Damage to the ship's starboard quarter, resulting from a Japanese aerial torpedo hit received off Formosa on 16 October 1944. Photographed in a floating drydock at Ulithi Atoll, circa November 1944. The upper part of the torpedo hole had been partially patched when this view was made. 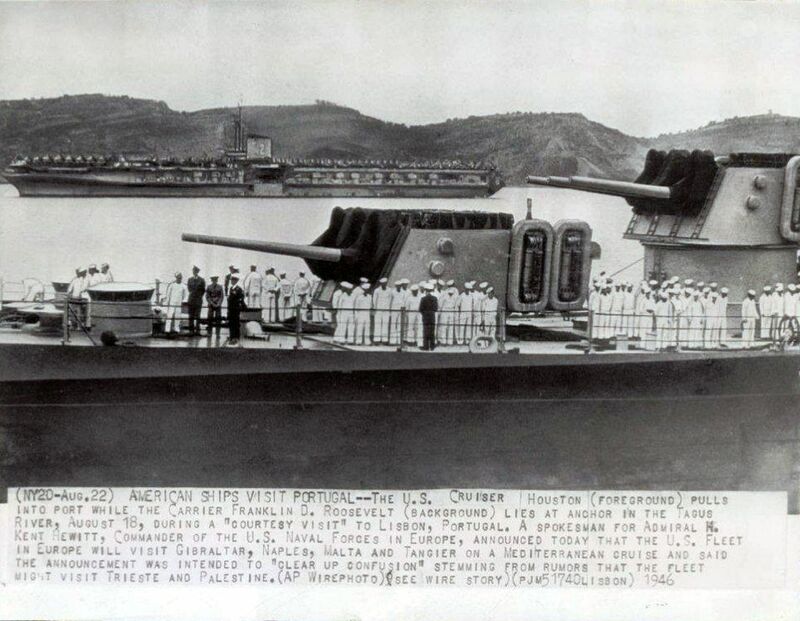 Note Houston's propellers and badly distorted rudder. Photograph from the Bureau of Ships Collection in the U.S. National Archives #19-N-105833. 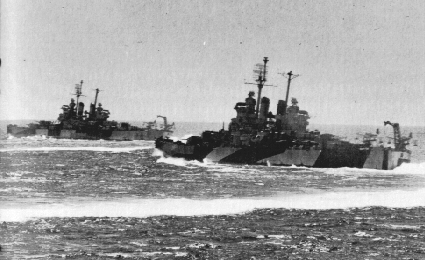 USS Houston (CL 81) alongside USS Hector (AR 7) at Ulithi Atoll, 1 November 1944. She was under repair after being hit by two Japanese aerial torpedoes on 14 and 16 October, during operations off Formosa. A LCM is passing by in the foreground. Official U.S. Navy Photograph, now in the collections of the National Archives #80-G-373678. 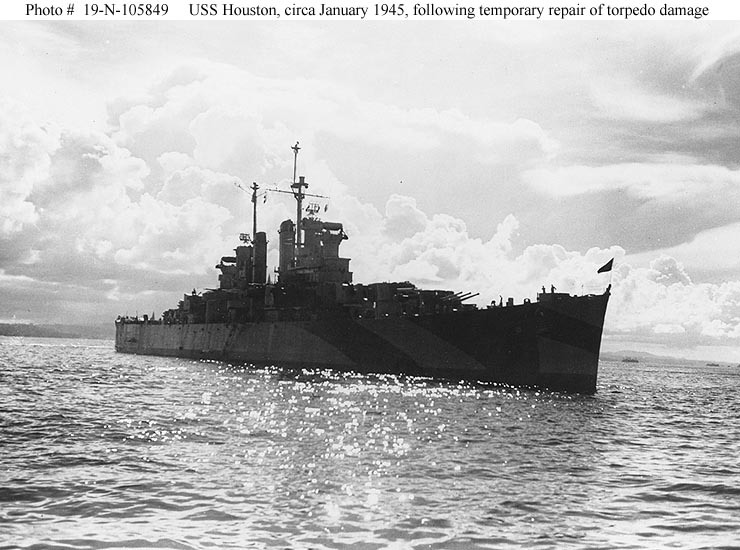 USS Houston (CL 81) Photographed circa January 1945, following temporary repair of torpedo damage received off Formosa in October 1944. Photograph from the Bureau of Ships Collection in the U.S. National Archives #19-N-105849. 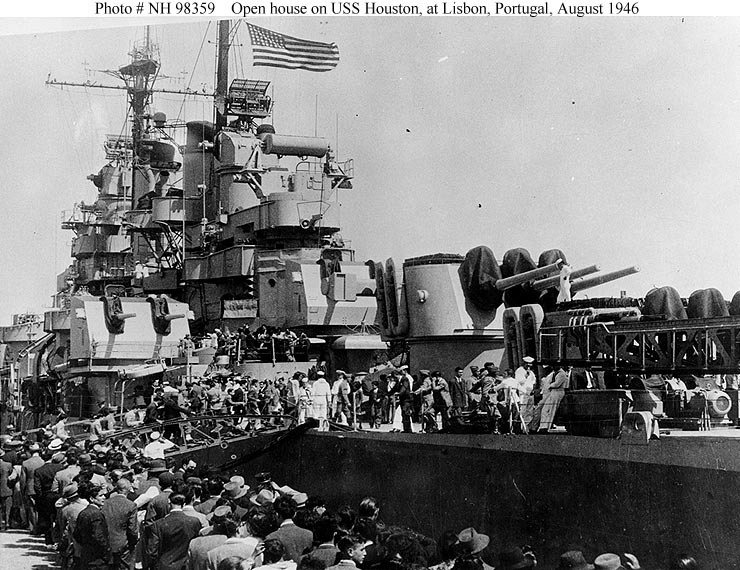 USS Houston (CL 81) Holding an "open house" at Lisbon, Portugal, 18 August 1946, during a visit there by units of the 12th Fleet. Taken from the harbor wall by a USS Franklin D. Roosevelt (CVB 42) photographer. Courtesy of the Naval Historical Foundation. Collection of Admiral H. Kent Hewitt, USN. Official U.S. Navy Photograph, from the collections of the Naval Historical Center #NH 98357. 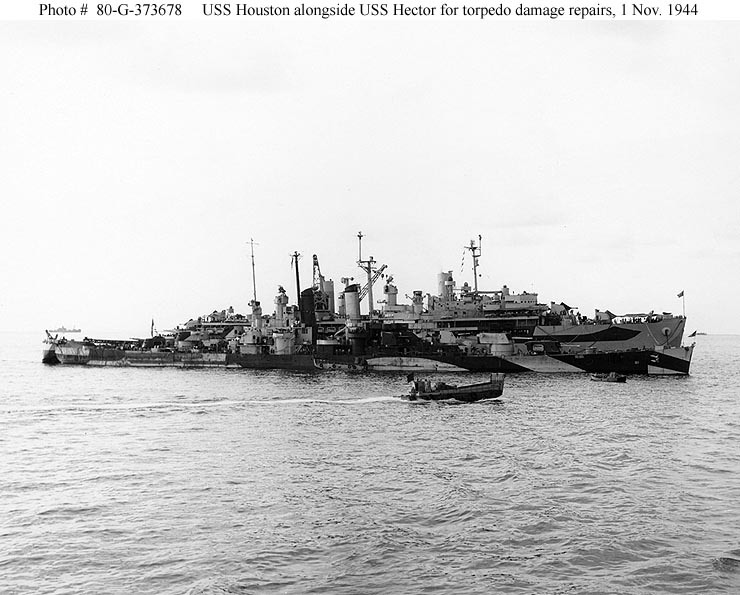 USS Houston (CL81) Torpedo Damage Off Formosa 14 and 16 October 1944 from the Naval History and Heritage Command.